Designed for maximum function, fit, and durability. We took the time to re-examine and optimize every feature for progressive freeride. Designed top-to-bottom for maximum function, fit, and durability! • Premium goatskin palmside, with second layer reinforcing fingertips and high-stress zones. • Breathable synthetics on back of hand, including stretchy neoprene knuckle accordion. Choice of blue or purple accents. • Intelligent seam placement for fit and durability. 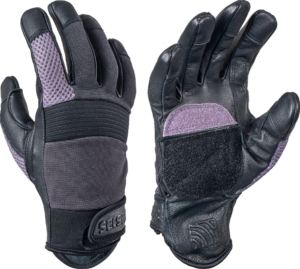 • High-strength, form-fitting goatskin/neoprene hybrid cuff with easy pull-on extension and industrial-strength Velcro. 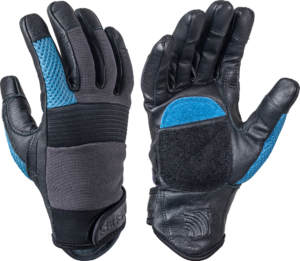 • Velcro split at natural palm crease for full hand mobility.